Lately it seems like everything we possibly need in life can arrive at our doorstep in a couple of days—and with free shipping! No need to put on clothes and leave the house, and certainly no need to fight traffic and interact with a live human being behind a counter. Unless you’re seeking a personable experience. It’s definitely true! When you shop local, a real live person does a happy dance when they get your order. Historic Downtown Belmont offers a collection of over fifty unique specialty shops and eateries in a beautiful and charming small town setting. With treasured antiques, hand crafted pottery and jewelry, customized gifts, local wines and specialty foods, there are plenty of great choices for customers seeking one of kind unique gifts. You must admit, you smile big and feel like dancing when a store owner thanks you by name for shopping in their store. In return, small-business owners in Belmont will continue to build their businesses to serve you and your needs. When you shop local, you support your local economy. Your taxes are going to support your community, and you are supporting jobs in your community as well. The best part? Those dollars keep being paid forward—the local person that made you your morning latte will spend their tip money at the local restaurant on their lunch break, the restaurant owner will sponsor an event that brings more people into downtown Belmont, and so on and so forth. Approximately 73 percent of the money spent at locally owned businesses stays local, compared to 43 percent of the dollars spent at non-locally owned stores, and zero percent of money spent online are retained in Belmont. 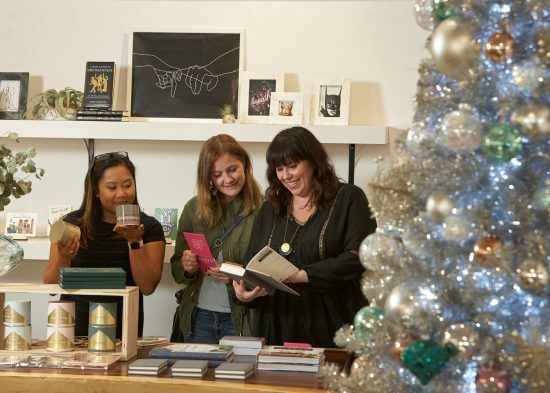 So when you Shop Small this holiday season, you’ll not only find a pair of running shoes, clothes, antique furniture or a unique gift, but you’ll be giving the gift of a sustainable community. 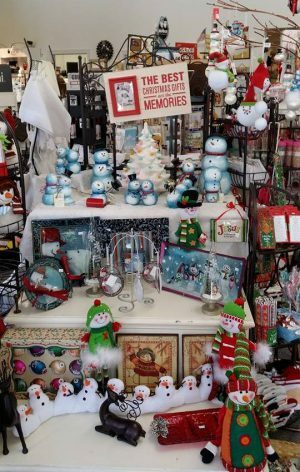 businesses roll out the carpet with holiday merchandise, discounts, refreshments, and special promotions. On Saturday, November 24, businesses throughout Downtown Belmont will celebrate Small Business Saturday. Created in 2010, Small Business Saturday encourages holiday shoppers to visit locally owned stores to check off their shopping lists. This annual event falls on the first Saturday after Thanksgiving – or as some know it – the recovery day after Black Friday. But as Black Friday has crept into Turkey Day, Small Business Saturday offers more mindful shoppers a way to enjoy Thanksgiving and then support the local community two days later. Be sure to support Belmont’s local shops and find that special little something from AR Workshop, Bandera Home Décor, Belmont’s Specialty Foods, Blythe Gallery, Bliss Gallery, Catawba Antique Mall, Doc’s Comics, Gigi’s Boutique, Happy Dog Café, Jeans Flowers, Jolie Boutique, Meraki Interiors, Parker & Company, Piccolo Antique Mall, South Main Cycles, Surprise Me and Walk & Run. festivities. This year, children of all ages will enjoy activities all month long including a magical “Festival of Trees”. The mayor will host the traditional lighting of the tree on the City Hall lawn on Saturday, December 1, 2018 at 6:00 PM followed by a holiday stroll down Belmont Main Street and through Stowe Park to experience the inaugural “Festival of Trees”. 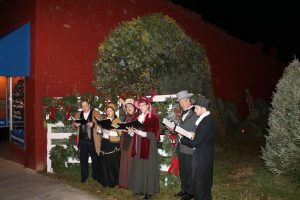 The evening will include special music, hot chocolate and cookies provided by Belmont’s Specialty Foods. 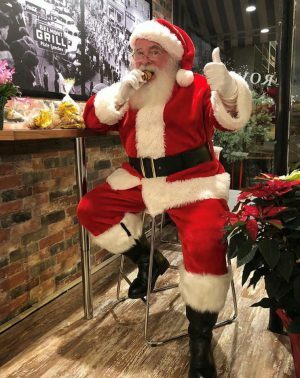 shopping and dining, horse drawn carriage rides, children’s activities, food vendors, live music, hay rides, holiday characters and a visit with Santa. Come enjoy a magical holiday stroll down Historic Belmont Main Street and Stowe Park’s “Festival of Trees”. November 22 Turkey Day 5K (BCO Benefit) 8:00 A.M.
November 24 Breakfast With Santa At Cherubs 9:00-11:00 A.M.
December 1 Girls on the Run 5K 8:30 A.M.
December 1 Belmont Christmas Lighting Ceremony 6:00 P.M.
December 4 Belmont Christmas Parade 3:30 P.M.
December 6-8 Horse Drawn Carriage Rides 5:30-9:30 P.M.
December 13 Horse Drawn Carriage Rides 5:30-9:30 P.M.
December 14 Horse Drawn Carriage Rides 6:00-10:00 P.M.
December 15 Belmont Christmas Village 5:00-9:00 P.M.
December 22 Santa Hustle Half Marathon & 5K 8:00 A.M.
For more information, please visit www.cityofbelmont.org.